In October, the National Immigrant Justice Center (NIJC), a leading advocacy group based in Chicago, released a detailed report on immigration detention center contracts that illustrates just how inadequate the ICE detention facility inspections are after promises and attempts by the Obama administration to improve the oversight process. President Obama established the Office of Detention Oversight (ODO) within ICE to inspect immigration detention facilities and investigate the deaths of individuals in ICE custody. Despite these efforts, the immigration detention inspection process still occurs cloaked in ICE’s culture of secrecy, the NIJC report, titled Lives in Peril, reveals. Having obtained all ICE detention facility inspections from 2007-2012 through Freedom of Information Act (FOIA) litigation, the NIJC has identified how these inspections continue to be ineffective and how ICE must address them. ICE’s Enforcement and Removal Operations (ERO) inspections generate the ratings that determine whether the government continues to fund local governments or private entities to detain immigrants. The DHS Appropriations Act, amended in 2009, clearly indicated Congress’s intent that immigration detention facilities need to adhere to humane standards of detention. ICE has acknowledged this obligation by implementing the ODO and ERO inspections, but the lack in transparency of reporting and inspections does not allow the public to accurately measure ICE’s procedures. Before discussing the inefficiencies and pitfalls of the inspections it is crucial to understand how and who conducts them. There are three types of inspections that facilities can undergo. First, facilities that hold 50 or more people are subject to inspections conducted by ICE’s ERO office. Private contractors conduct the ERO inspections annually. Those inspectors use a checklist of relevant national detention standards found on ICE Form G-324A. Second, facilities averaging 50 people or more a day can be subject to ODO inspections as well. ODO inspectors focus their investigation on standards which have been previously identified as not in compliance. Ironically, ODO inspectors many times are ICE employees or contractors bringing into question the effectiveness of their investigations. Lastly, facilities that hold immigrants for less than 72 hours at a time or fewer than 50 immigrants for more than 72 hours are subject only to the Organizational Review Self-Assessment process. The documents evaluated by NIJC contained only inspections under the first two categories above. Currently there are three sets of standards used for detention inspections publicized by ICE: 2000 National Detention Standards (NDS) and the Performance-Based National Detention Standards (PBNDS) issued in 2008 and 2011. The Detention Standards Compliance Unit office within ICE interprets the detention standards. Charged with overseeing three sets of standards means that government watchdogs can not apply a uniform assessment regime. Moreover, even when facilities are inspected using the same set of standards, the particular type of contract under which a facility operates may alter the inspection outcomes. Different detention facility contracts determine which specific requirements of each standard apply and, by extension, which are reviewed during an inspection. For example, a facility run by a local government, that ICE has contracted with by an Intergovernmental Service Agreements (IGSAs), is permitted to determine which components might be mandatory for compliance, while Service Processing Centers (owned and operated by ICE) are not allowed such flexibility. These loopholes create even more incentives than purely economic gain for ICE to contract with private companies and local governments to run detention facilities. This flexibility permits ICE to sidestep responsibility of maintaining equal facility standards, while gaining monetary gains from contracts for facilities. The NIJC report highlights how the current detention facility inspection process continues to be ineffective to adequately give the immigrants basic humanitarian services. First, ICE’s culture of secrecy persists even through President Obama’s attempt and promise to make federal government activities more transparent. This is evident from the fact that NIJC only acquired these documents through costly FOIA litigation. ICE does not publicly post inspection reports. Secondly, ICE inspections fail to adequately assess the conditions detained immigrants actually experience while detained. All facilities are given notice prior to an inspection of when the inspection will be held. Facilities are free to fix conditions or, at least, do the bare minimum in order to pass inspections without having to keep that standard on a constant basis. More troubling is that facilities are continuously inspected using outdated standards. Sixty-five of the 103 detention facilities for which NIJC obtained 2012 or 2011 inspection reports were still inspected against the least-rigorous 2000 NDS. Also, the inspection standards themselves use a simple checklist form with a select few components requiring mandatory passing rates. These mismatched mandatory standards create a process that fails to adequately provide accurate and uniform inspections of facilities. Combined, the inspection process lives in secrecy allowing ICE and detention facilities to craft their way to stay open without operating as a meaningful check on detention conditions. The report highlights six immigration detention facilities throughout the country that have been subjects of media reports, human rights investigations, and congressional inquiries. These facilities’ performance provides present examples into the manipulation and lack of transparency of the detention inspections process. They demonstrate how ICE is complicit in covering up failures to address violations and in timely releasing information regarding these facilities’ inspections. Ultimately, NIJC provides three overarching recommendations for improvement to the detention inspection process. First, the group calls for increased transparency and oversight of the inspection process. This can be accomplished by making ERO and ODO inspections reports freely available to the public in a timely manner. Along with these reports ICE should include data on suicide attempts, hunger strikes, work program stoppages, use of solitary confinement, use of force, and other significant events at detention centers. Second, NIJC advocates for the quality of the inspections to improve. In order to increase quality, the inspections should be conducted unannounced at least once a year and be performed by an ombudsman who is independent of ICE. Also, facilities should not be allowed to take advantage of loopholes to compliance. All detention standards provisions must be mandatory, rather than the “à la carte” approach that has overrun the system today. In order for inspections to truly reflect the detained immigrants’ experience the inspectors must interview detainees during inspections, as well as other stakeholders and visitors. These sources of information would capture the range of concerns at a facility that are not found through the current formal institutional channels. 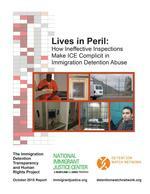 Lastly, NIJC urges ICE to institute consequences for failed inspections by detention facilities. Currently, institutions can fail inspections and continue receiving funding for their facilities. Rather, the detention facilities should be placed on probation and subject to more intensive inspections after the first finding of substantial non-compliance. Also, facilities must face the possibility of terminating its contract when repeated findings of substantial non-compliance occur in two consecutive inspections. The detention inspection process is far from transparent and it is seriously lacking consistency. Organizations such as the NIJC provide invaluable looks into the immigration detention system and this information leads to calls for improvement by the public. Whether ICE chooses to addresses these weaknesses is now their choice. Thamys Gaertner is a second-year law student at the University of Denver Sturm College of Law. Thamys is currently completing an externship with the Rocky Mountain Immigrant Advocacy Network. She is passionate about immigration law and hopes to dedicate her career to representing immigrants.